Just to add a little more excitement for cycling fans in the month of May, the Tour of California now rides into the scene. (Yes, that’s right, for those following along at home, it goes on at the same time as the Giro d’Italia.) This eight day race takes us through some of the most scenic areas of the state, goes over some rigorous climbs and attracts some top-notch teams and riders. California is truly a melting pot and its cuisine is influenced by a broad palate of flavors and styles. Food in California is influenced by not only the immigrants that have settled in the state (Asian, Latin American, Italian, etc.) but also from the abundance of local foods that are easily accessible. Honestly, I’m always amazed at the wide-variety of fruits and vegetables that are available on the side of the road any time of the year. And, finally, I would be remiss if I didn’t mention all the health food and the general acceptance of the vegetarian and vegan lifestyle. Huzzah! For those ready for a glass of wine, immigrants not only brought food influences, but also the beginnings of wine production in the state. In the 18th century, the Spanish brought the first grape vines and, well, the rest is history. Fast forward to the 21st century, and now California boasts over 90% of all wine production in the United States. Shall I also cite the 1976 blind taste test that vaulted California into the spotlight for producing decent wines to the Bottle Shock of France? So, let’s get this California party started with a recipe from one of my most favorite vegan restaurants – Millennium in San Francisco. This recipe features many of the local ingredients found in California but specifically highlights the avocado. Avocados were introduced in California in 1871 by Judge R.B. Ord. (Yeah, that’s right, California history is so young that we even know the name of the guy that trotted across from Mexico with avocado trees and plopped them into Santa Barbara soil.) By the time the 1950’s rolled around there were almost 25 varieties of avocado being grown in the state. This soup was divine – fresh, healthy and unique with the saffron-lime ice as an extra adornment. It went down smoothly on a warm spring day. It does make a lot (since there are only two of us in the house we had an enormous amount leftover). Note, avocado, by its nature, is very sensitive once it’s cut open so I wouldn’t sit on this soup for more than a day…or two. 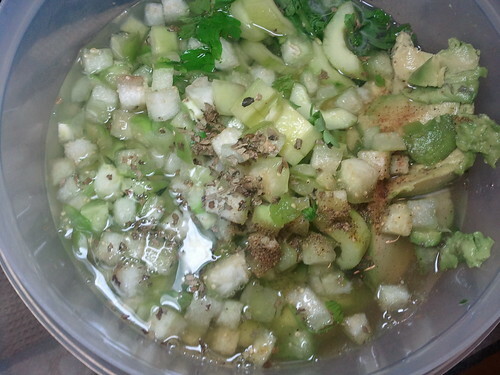 To Make the Ice: Mix all of the ingredients together in a bowl and pour into a 2 inch deep pan. Freeze for 3-4 hours until solid. To Make the Soup: Heat a large non-stick sauté pan over high heat. Add the onions, garlic and jalapeño. 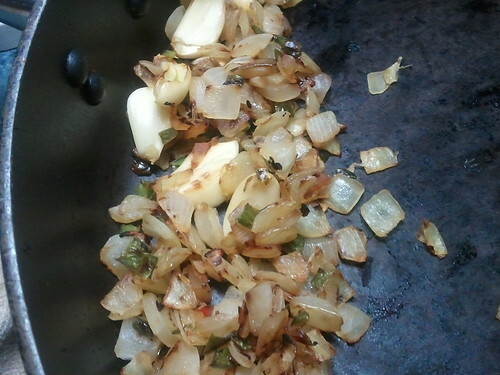 Dry toast, stirring frequently, for 7-10 minutes, until half the onions, garlic and jalapeño are charred. Remove from the pan and let cool to room temperature. Peel and seed the jalapeño. 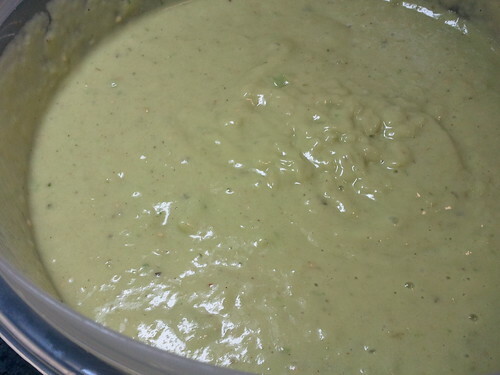 Place the avocado in a mixing bowl with the cooled onion, garlic and jalapeño. 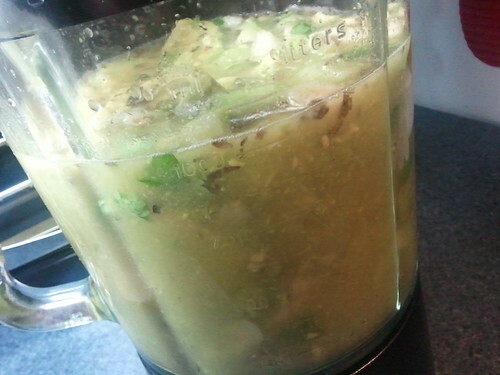 Add the tomatillos, cucumber, cilantro, oregano, nutmeg, black pepper, lime juice, miso and water. In a blender, or using a hand-held immersion blender, blend the ingredients in batches until smooth. Add salt and cayenne pepper to taste. Refrigerate for at least 2 hours or until well chilled. To Serve: Ladle the soup into 6 martini glasses. Sprinkle toasted almonds over the top of each. 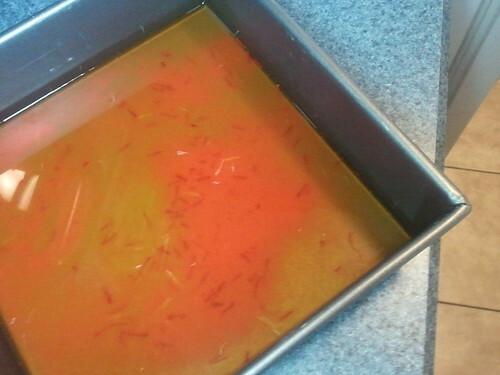 Scrape the saffron ice crystals off the pan with a fork, and place 2 teaspoons on each serving of soup. Serve immediately.